Outcrop images (faulted strata, interbedded shale and limestone beds that have been tilted, beach rocks of different lithologies) can be used to bring the field into the geoscience classroom, giving students practice in doing what geoscientists do when they are in the field. These particular images are examples of interesting geologic puzzles. These images can be used in both small and large classes in various think-pair-share formats, with times ranging from five to twenty minutes per image. These images have been used in historical geology courses and could be used in other geoscience courses. Are these igneous, metamorphic, or sedimentary rocks? 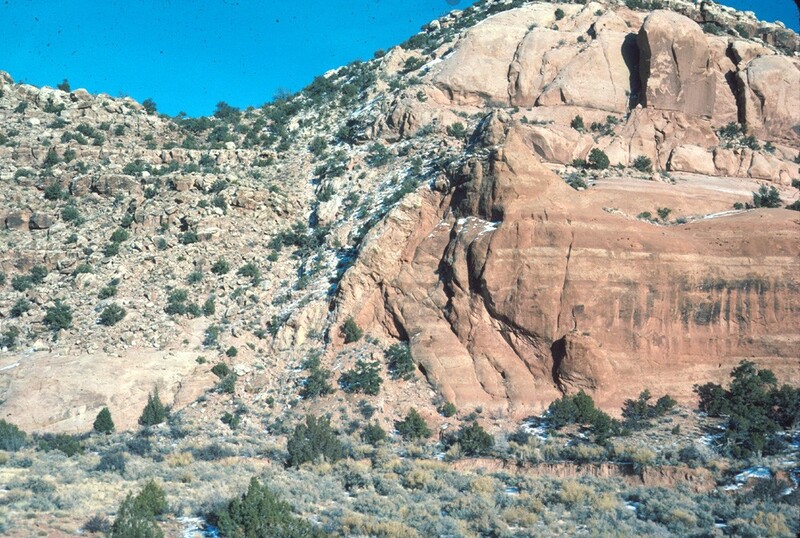 Are the layers continuous across the outcrop? Can you identify any unit that is present on both sides of the image? What type of fault is shown in this image? If you could get closer to the outcrop, what you look for? In either case, after a few minutes, call for responses from students. You might do this using a using a think-pair-share format. Be prepared for a range of responses including ones you might not anticipate. Student answers provide useful insight into their observational skills and thought processes. The potential questions given below with each image are examples of questions to use as follow-up questions after students give their initial responses or could be a series of directed questions if you don't use a think-pair-share structure. This activity includes informal assessment of the class. You could also collect the sketches and or lists of observations and interpretation(s). This kind of activity is described in Reynolds and Peacock (1988) . The American Geological Institute maintains a growing Image Bank (more info) , divided by category. Earth Science Picture of the Day (more info) has a searchable archive of photos.